When the Aston Martin DB5 finally keeps its date with James Bond, the audience gasps and sighs, followed by hoots, claps and whistles louder than the ones Bond was welcomed with in the opening sequence of Skyfall. A clear indication of the audience’s relief and excitement to finally see yet another symbol with Bond writ all over it. Such scenes and audience reactions, in Sam Mendes’ take on 007, however, are few and far between. For director Sam Mendes treads the middle path, balancing conventional Bond clichés with modern, more realistic storytelling—he portrays Bond as more than just a secret agent by delving into Bond’s psyche and exploring his and other characters’ gray areas. Ian Fleming will turn in his grave to see the neo, aging, crestfallen bond. Welcome the new Bond. He is no more the unidimensional British spy only chasing baddies, bedding babes and saving his country. He is a man with a past whose demons haunt him, who falters more than he succeeds, who has to work hard to prove himself, and who suffers from mid-life pre-retirement blues. Bond is a genre in itself and purists might hate Mendes for defying the canon, but that’s exactly what makes Skyfall an interesting watch. Mendes isn’t the first one to flout the rules but he sure does lift the franchise notches higher, extending that relatable human element to other characters and the entire plot at large. Even Bond baddie Silva (Javier Bardem in what some might call a delicious performance), has a haunting past and, in-league with neo-noir baddies like Nolan’s Bane (The Dark Knight Rises), is always paces ahead of the protagonist with an obsessive, single-minded agenda that makes his character more gray than black, blurring the lines between good and evil. Or Bond’s boss, the enigmatic M (Judi Dench), going through a rough professional crisis herself needs Bond to prove his loyalty to her. 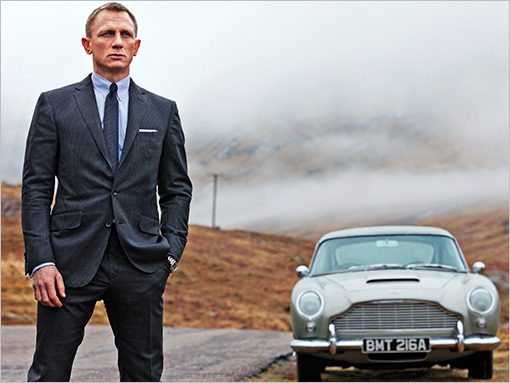 As Skyfall nears its climax, Bond’s bond with M (almost like a motherly-figure?) is revealed further leading to one of the best emotional Bond finale’s ever on screen. Mendes also reintroduces some of the old world Bond charm using orthodox weapons like rifles, hand grenades, booby traps and gas cans to good effect. Even the ending sequences, shot mostly in a dimly lit old estate and secret tunnels, add a gothic appeal rarely seen in Bond films. When a character in the film says, “I was ready before you were born, son!” it’s a hint to Mendes that the Bond franchise was always ready for him to make that one special Bond flick. For me, Skyfall is one of the best Bond flicks in recent decades that reconnected me with Bond at a more personal level minus some of the hackneyed secret agent storytelling. It’s not known if Sam Mendes will don the Bond director mantle again, but for ol’ time’s sake, play it again Sam! Tags: Aston Martin, best bond film, Daniel Craig, emotional bond film, James Bond, Javier Bardem, Judi Dench, realistic, relatable, Sam Mendes, skyfall. Bookmark the permalink. Prakash – I loved, too, how at the end when Bardem’s gang blew up the Aston Martin – THAT’S when Bond got REALLY MAD. I got a kick out of that. There were a lot of great laughs/nods in the film. A real high kick. ENTIRELY! The Aston Martin burning is in a way yet another symbol of burning down all the cliched symbols associated with Bond, for them to rise again from the ashes, all new, all reinvented. Good review Prakash. Quantum of Solace was a huge step-down for the franchise, but thankfully, this one takes it back up to where it was with Casino Royale and hopefully it stays there because it’s just so much damn fun. For me, both Quantum and Casino didn’t really work. To be honest, I didn’t like too many of the Brosnan Bond movies either. But this one beats em’ all and sets new standards. I doubt if other directors can take it any higher or even maintain the bar that Mendes has set. PS – I like the new clean theme for the blog. Thanks David. It was a conscious effort to change to a minimalistic look. And a designer friend of mine, Gopi, helped me choose and customize the Theme. I’m still working on more customizations and you’ll see them soon. You have did it again, great review !!!!!!!! !